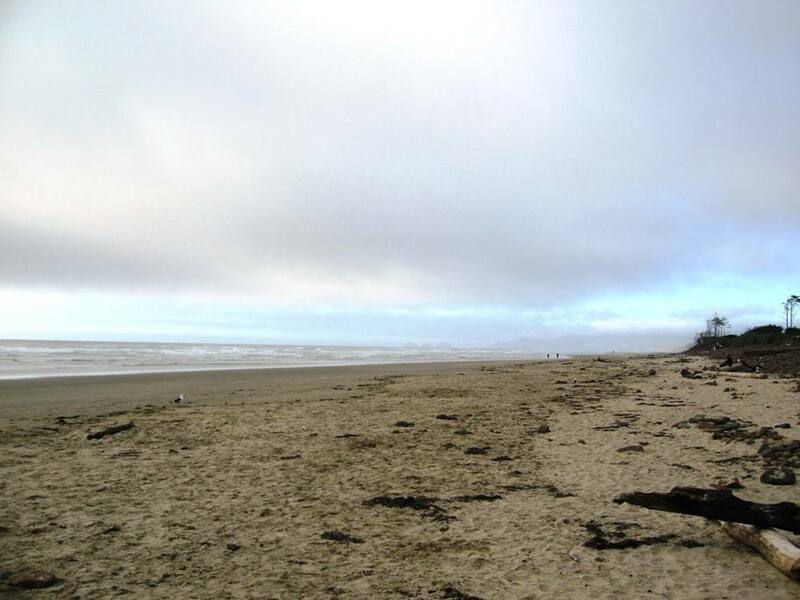 A few days ago, my husband and I headed off to the Oregon Coast for a little break. For months we’ve been looking forward to this getaway, a cabin offered through the Oregon State Parks system. 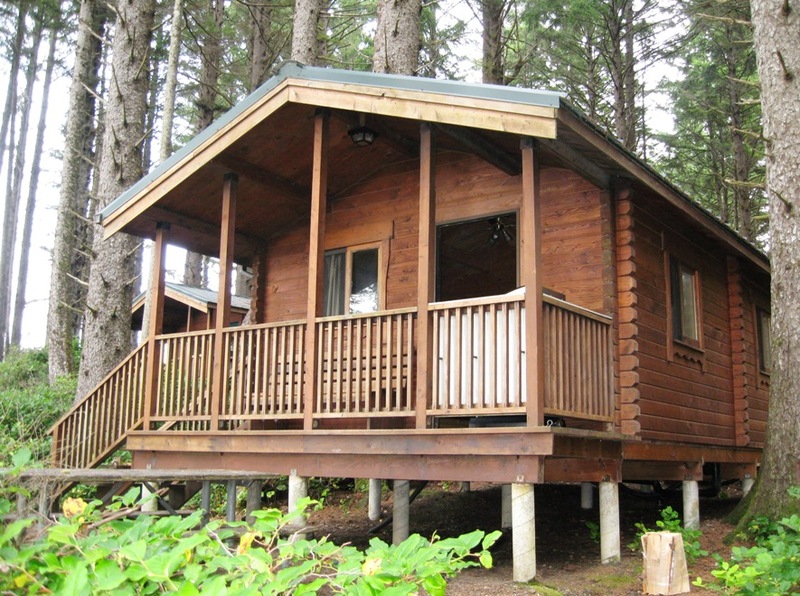 With a toilet, shower, microwave, and bunk beds, vacationing in one of these little beauties is not exactly roughing it. 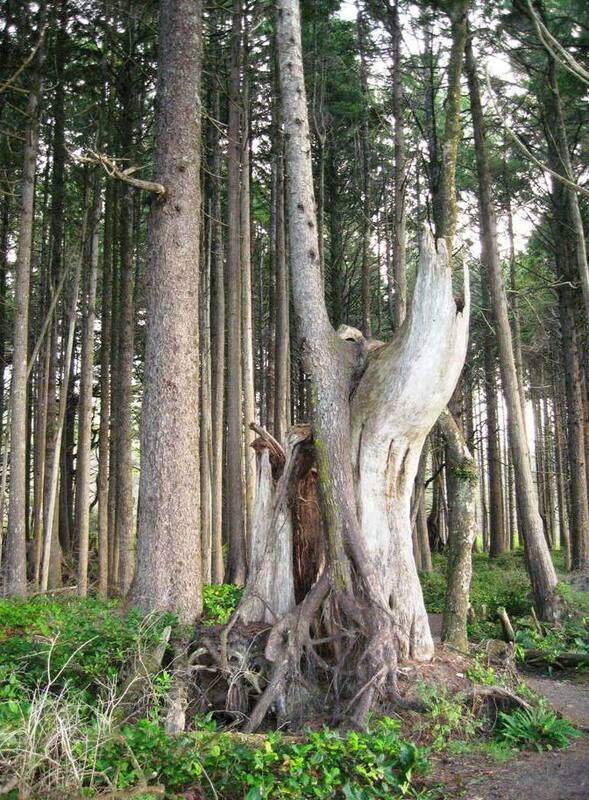 However, I much prefer to be in the forest right next to the beach rather than in a motel room. From a sunny day in the 90s we entered a foggy atmosphere in the 60s. The break from the heat was nice. 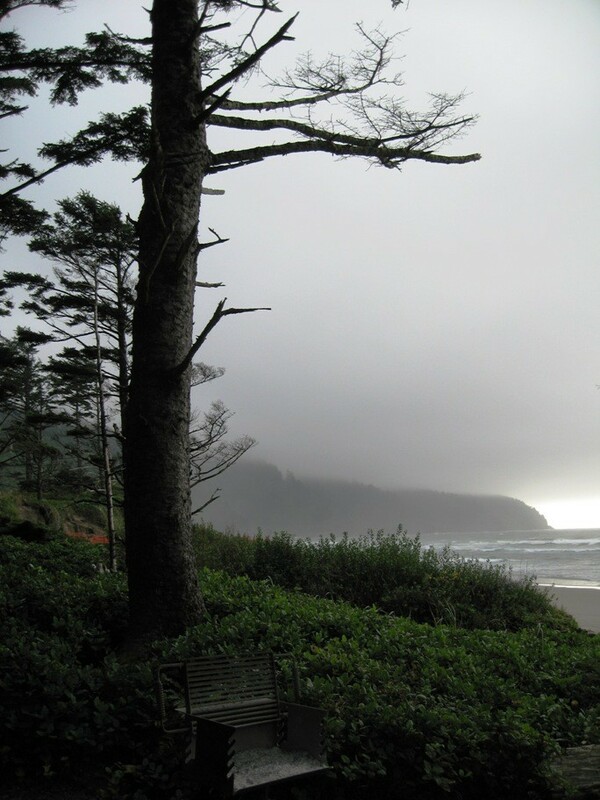 I love the towering overstory, woodsy scents, and booming surf. The beach is quiet after Labor Day. You can walk for miles without running into anyone. 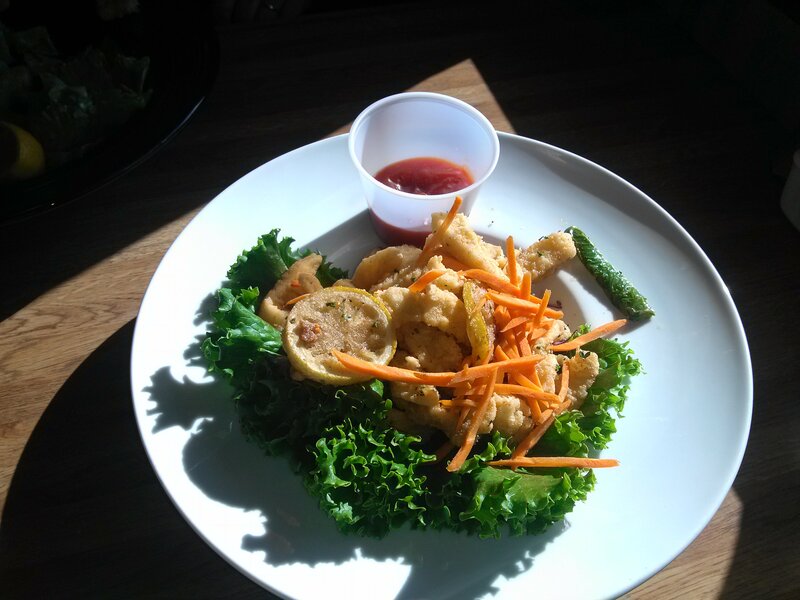 A feast of calamari, provided by Pacific Restaurant. 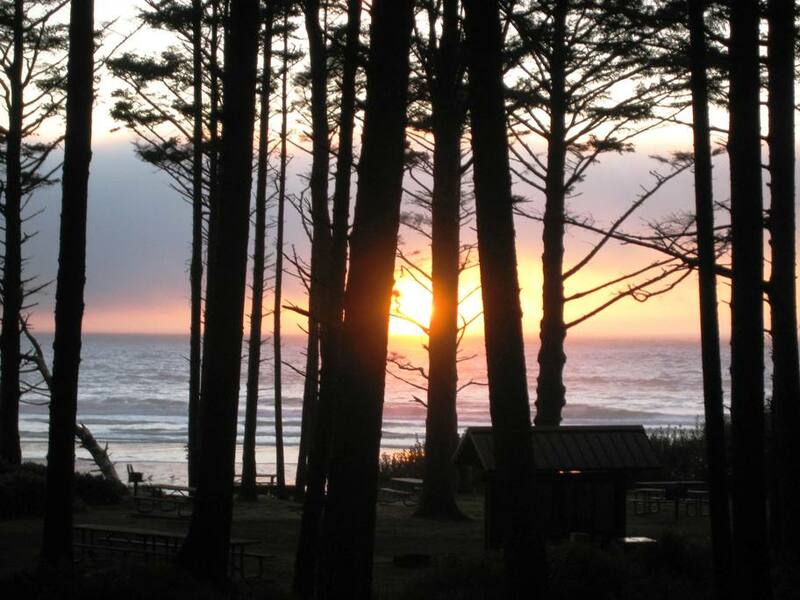 Sunset over the Pacific Ocean was spectacular from our cabin. 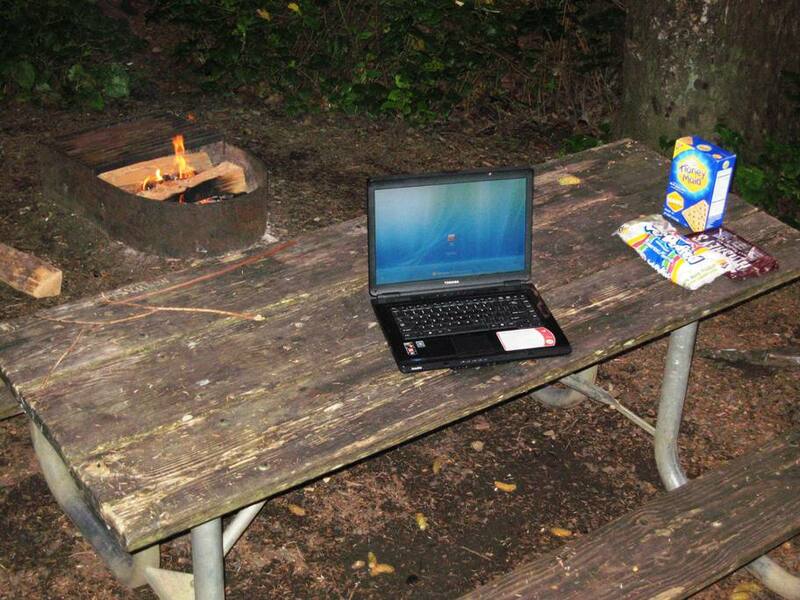 I even got a little writing accomplished by the light of the campfire, in between s’mores. Just over 1,000 words, if you’re curious. I’ve found that I really enjoy writing in different locations. New surroundings seem to add some zest. On day 2, we stopped in at the Tillamook Air Museum. 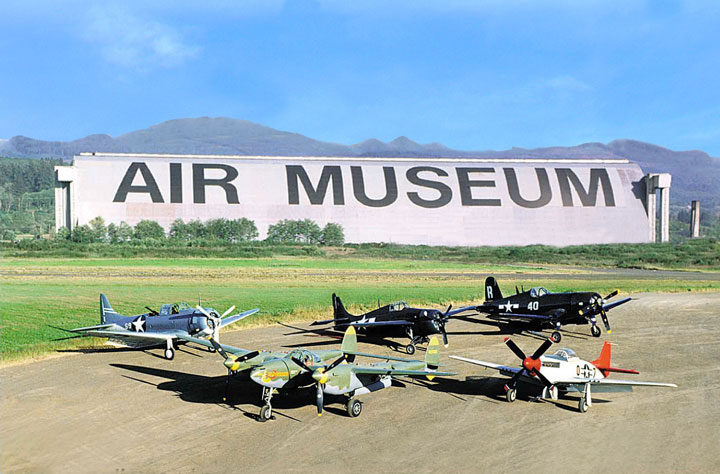 Why would Tillamook, Oregon, a town known for its cheese, with just over 4,900 people, have an air museum? I’m glad you asked. Tillamook was the site of a blimp base during World War II, one of only ten such bases on U.S. soil. 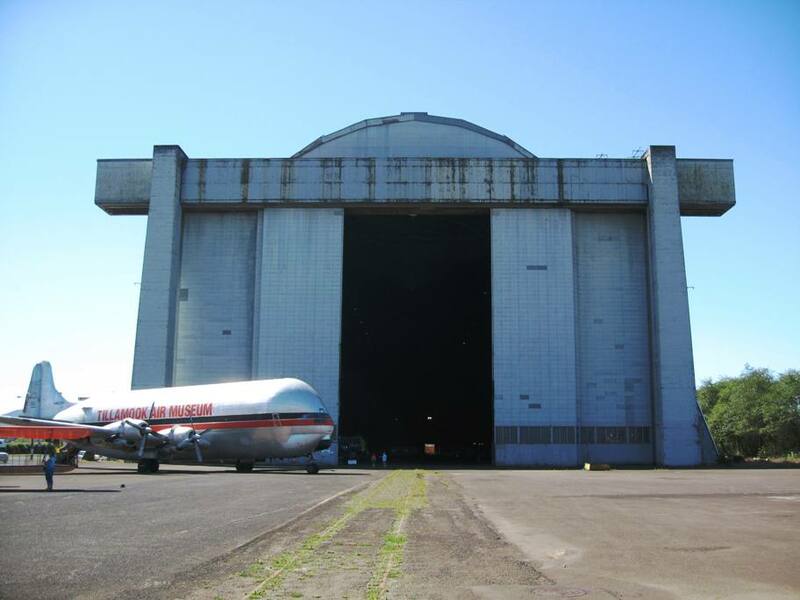 The blimp hangar at Tillamook, which houses the aircraft collection, is one of the largest wooden structures in the world. The plane on the left is a Mini Guppy. 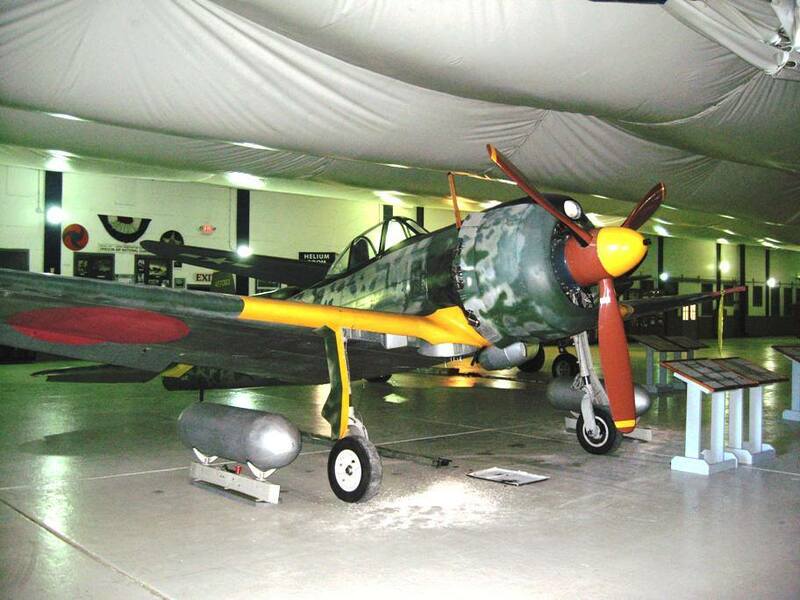 The Nakajima Ki-43 Hayabusa “Oscar” is a rare Japanese fighter plane. They were used extensively as kamikaze aircraft at the end of the war. 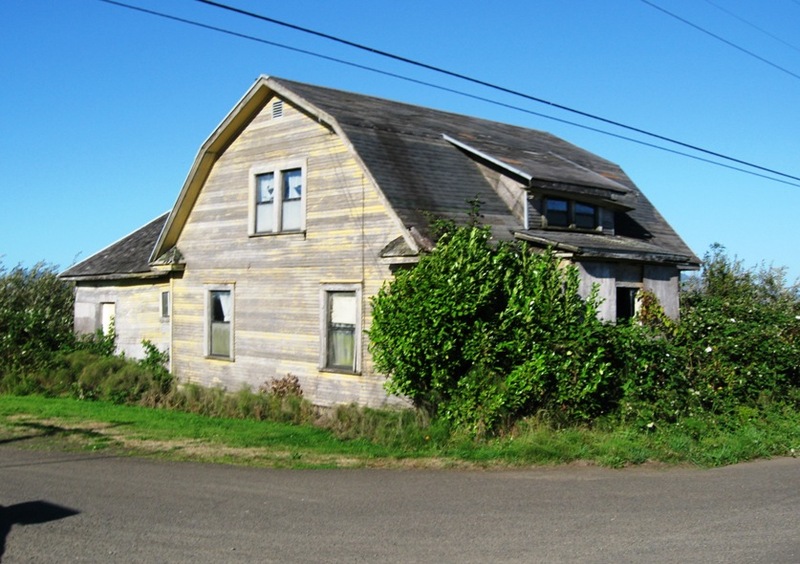 A spooky house on the outskirts of Tillamook. This is what our house would look like if I didn’t hack back the overgrowth every once in a while. It was a short trip, but very enjoyable. We’ll be back! Note: All pictures were taken by my husband unless otherwise specified. Blessed are the owls, for they shall inherit the mystery and magic of the night. Do you ever feel that you’re just not in synch with the people around you? You’re soaking your brain in caffeine in the early a.m., trying to shake off sleep like a bear in spring, while your coworkers behave like busy beavers and Chatty Cathys. Then, just about the time everyone is clocking out, your brain lights up like a firecracker. If that sounds familiar, chances are you’re a night owl. Night owls, or evening people, tend to stay awake past midnight, perhaps even until dawn. They feel most lively in the evening. Morning people, on the other hand, also known as early birds, early risers, or larks, get up around 6 a.m. and feel most energetic in the morning. I’ve been a night owl since I was a kid. In the summertime in my preteen and teen years, I stayed up late reading or watching TV well past anyone else in the household—and I was the youngest. During the school year, I conformed to the school schedule, but those hours were never my preference. Nocturnal habits followed me into college, where I typically opted for afternoon classes and studied in the evenings. Sometimes I lucked out with work. For instance, for a couple summers during college, I worked the swing shift at lumber mills, 4 p.m. to midnight, which coordinated well with my natural rhythms. (I also worked the graveyard shift, midnight to 8 a.m., but didn’t like that at all.) After graduation, however, daytime hours were the workplace norm, and getting up early, day in, day out, became an unpleasant grind. Before too many years had passed, I figured out a way to work for myself and set my own hours. So why do some people feel more active in the morning and others in the evening? Are early birds and night owls just people with slightly altered sleep tendencies, or is there more to the phenomenon? Scientists have discovered that the number of people who identify as night owls or early birds is surprising high. A survey of more than four hundred adults found that about 15% were morning people, 25% were evening people, and 60% were intermediates, according to Carolyn Schur in Birds of a Different Feather. Studies performed at the Max Planck Institute of Psychiatry in 2008 showed that sleep-time preferences are often inherited, and additional research indicates that 50 percent of sleep-time choices are determined by genetic factors. In fact, rare gene mutations are linked to entire families whose members wake up at 3 or 4 in the morning and cannot stay up much later than 8 p.m. This all makes sense in the context of my family. My mom is a morning person and my dad (now deceased) was a night owl. My two oldest siblings follow my mom’s pattern, while my other sister and I are more evening people, like my dad. Some speculate that the division between larks and owls is rooted in evolution, with early risers in the ancient past immersed in daytime activities such as food gathering, while owls took up guard duty as darkness descended. Studies have uncovered certain trends among larks and owls. 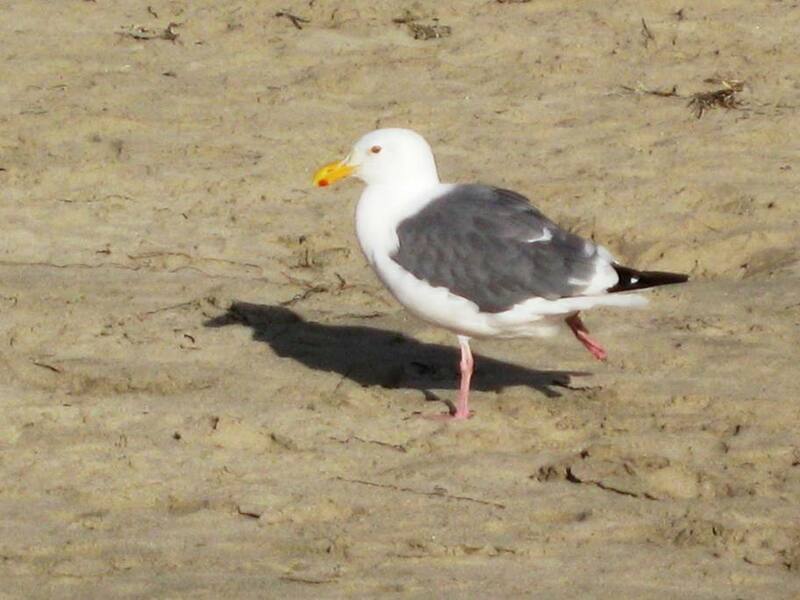 For instance, early birds tend to be more conscientious. They also display more positive emotions and are more proactive in general. “They tend to get better grades in school, which gets them into better colleges which then leads to better job opportunities,” according to Christopher Randler, a professor at the University of Education in Heidelberg, Germany. “Morning people also anticipate problems and try to minimize them,” he said. Night owls tend to be less reliable, less emotionally stable, and more likely to experience depression, addictions, and eating disorders. And that’s not all. A recent study in the journal Personality and Individual Differences indicates that staying up late is associated with a “dark triad” of personality traits: narcissism, psychopathy, and Machiavellianism. That all sounds pretty grim for owls, but take note of a few bright spots. Evening people, studies show, need less rest and are able to stay focused longer. Early birds may be more sensitive to sleep pressure than night owls. Oddly enough, evening people become physically stronger as the day goes on, but the strength of morning people remains the same throughout the day. People with higher IQs are more likely to be night owls, and they tend to have better memories and accumulate more wealth. Examples abound of famous early risers and night people, so neither pattern appears to hold an edge for success. Benjamin Franklin of the well-known “early to bed” idiom was a dedicated early riser. He reportedly began each morning by asking himself “what good shall I do today?” and ended it with “what good did I do today?” Ernest Hemingway, John Grisham, George W. Bush, Condoleeza Rice, Napoleon, Tim Cook, and Rachael Ray also fall within the early bird category. Famous night owls include Charles Darwin, Adolf Hitler, Joseph Stalin, Percy Bysshe Shelley, Marcel Proust, James Joyce, Florence King, Fran Lebowitz, Keith Richards, and Elvis Presley. Winston Churchill typically went to bed at 4 a.m. and rose late. As a result of his sleeping patterns, he often hosted War Cabinet meetings in his bath. One question that arises when discussing sleep patterns is whether night owls are more creative. The answer might indeed be yes. A Spanish researcher found that early risers were more likely to be logical and analytical, while those who stayed up late were more imaginative and intuitive. Night owls scored better on creativity tests than did intermediary and morning people, according to a study published in the February 2007 issue of Personality and Individual Differences. So what about you? Are you a lark? An owl? Something in between? Feel free to share your thoughts in the comments section. Kimberly A. Bettes at Here’s what I’m thinking and Honoré Dupuis at Of Glass & Paper have nominated me for the Sunshine Award. Thanks! You’ve brightened my day. Kimberly is a horror novelist living in the Ozarks who insists she doesn’t run moonshine. Do we believe her? You’ll find intriguing titles on her book list. Honoré is a writer, runner, metaverse-explorer, and all-around good guy. He also wrote a doll story that I find very disturbing. The Sunshine Award is presented to “bloggers who positively and creatively inspire others in the blogosphere.” I’m not certain I deserve that recognition, but I’ll take it. Like many writers, I started blogging because it seemed like a good way to get my name out there. Making friends through blogging was an unexpected bonus. I kept it simple and went with my pen name. I like to read blog posts that provide tips for writing or indie publishing. I also enjoy reading interesting pieces of writing. So, on any given day, I could have a couple of favorite posts among the many blogs I follow. Writing is my dream job, although I don’t know if I’d ever want to put all of my eggs in that basket. It’s nice to take a break from writing from time to time. Right now, I have it pretty good, balancing my freelance work and my writing. Half full. I appreciate what I have, and if something isn’t going my way, I figure out how to turn it around. If you could go anywhere on a week’s vacation, where would you go? That’s a good question. I love mountains and forests, but those are fairly close by, and I can get to them whenever I want. I’d say a tropical island in the Pacific. I’ve had a good time in Hawaii, so someplace like that would be great. Eggs and raspberries. I have many food allergies, but those are the biggies. Depends on the day. Milk chocolate mainly, but I do opt for dark from time to time. How much time do you spend blogging? In other words, are you one of those lucky people who can dash off a blog post in no time, or do you take forever on one post to get it just right? I’m a little slow on the blogging front. I tend to rethink what I want to say, and I’ve tossed out several ideas I’d already put some effort into. Writing fiction is faster and easier for me. Do you watch TV? If so, what are some of your favorite shows? I’ve always liked TV. Some of my current favorites are Breaking Bad, Justified, Mad Men, Game of Thrones, the Walking Dead, Vampire Diaries, Supernatural, House Hunters International, Survivor, the Amazing Race, Top Chef, and the NBC Nightly News. Shows I like that are no longer in production include Battlestar Galactica, Rome, Deadwood, the Tudors, Seinfeld, Veronica Mars, and Buffy. Favorite color: I like shades of yellow orange and various reds with purple tones. Favorite animal: I’m a cat devotee. The felines with whom we share our property wouldn’t have it any other way. Favorite non-alcoholic drink: It’s a toss-up between tea and Reed’s Ginger Brew. Facebook or Twitter: I’m not on Facebook, so I’d have to say Twitter. Your passion: I’m passionate about understanding behavior, human and animal. Giving or getting presents: I enjoy both equally. Once in a while, I’ll buy myself a birthday present. Then I tell my husband he’s off the hook. Favorite day: The days when everything falls into place are rare and special. 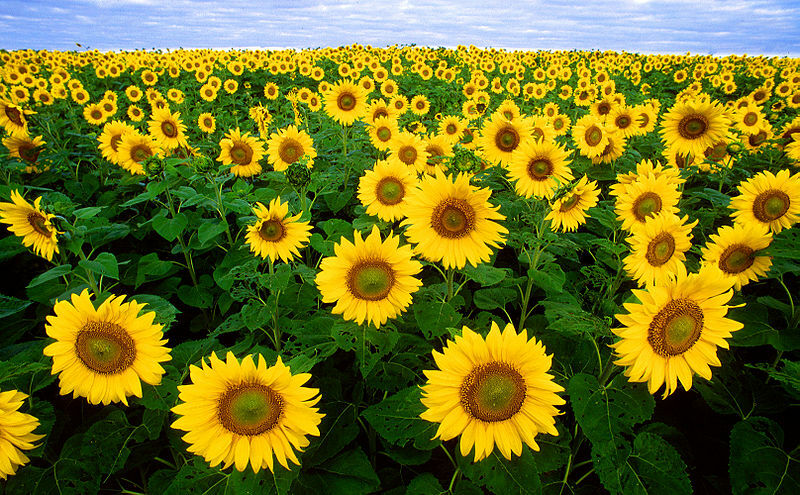 Favorite flowers: I never met a flower I didn’t adore. I’m visualizing zinnias, snapdragons, and sunflowers in my flower beds this year, with marigolds, lavender, nasturtium, and fuchsia on the deck. Hey, folks! Vickie McKeehan interviewed me on her blog. She is the author of eight books and likes gardening and chocolate—my kind of gal! Now, if only we could grow chocolate bars . . .
Marny, first of all I’m so impressed you have a background in anthropology and archaeology, two of my favorite subjects. I once considered archaeology as a major because I loved to dig in the dirt. Seriously though, tell us what exactly drew you to these two fields of study? And were you ever on an excavation dig? If so, we’d love to hear what you were looking for? Who doesn’t like digging in dirt? I remember actually eating dirt as a very small child. (I guess Mom couldn’t watch me every minute.) Plus, my mud pie collection was the envy of the neighborhood. So you’re sitting at a stoplight, waiting for the light to turn, bored out of your skull. Here’s a little something I turn to whenever I’m stuck in traffic. I think of a word using the letters on the license plate in front of me, keeping the letters in the same order. Here’s one from that vacation I’ve been meaning to take to Alaska. For this plate, etude works well, but so do perturb, restaurant, and beautiful. It doesn’t matter how many letters separate the ones on the plate. You just need to use them in the order you see them. Or, if that stumps you, try them backward or mix them up. 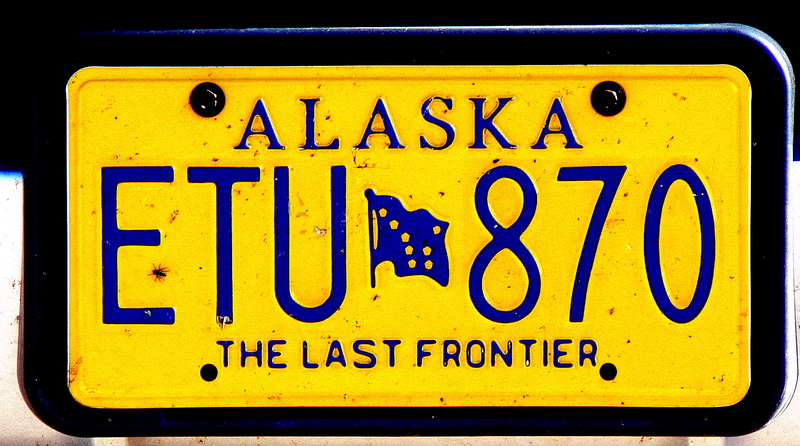 This game works in American states that use the three-letter license plate format. Delaware, Rhode Island, Maryland, and Illinois, however, are out of luck. If you’re traveling or live outside the United States, you may still be able to sharpen your verbal skills this way. 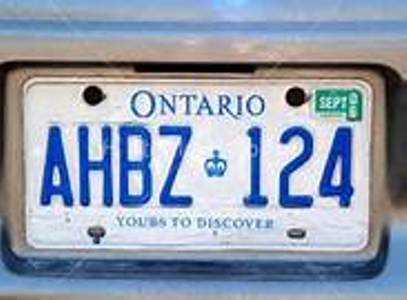 Several Canadian provinces, for instance, style their plates with three letters, although you may find yourself flummoxed in Ontario, which went to a four-letter format in 1997. 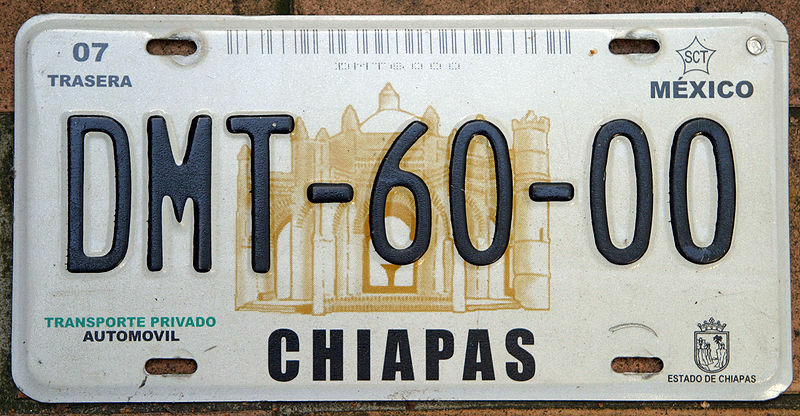 Mexico, too, uses three letters in most states, including Chiapas. Did you know that word games help stave off Alzheimer’s and dementia? So when you’re out and about, sitting at a stoplight, backed up on the freeway, or even walking through a parking lot, try this little diversion on for size. Word games boost the memory and keep the mind sharp, and they might just help you come up with more word choices the next time you sit down to write. John Howell at Fiction Favorites has nominated me for the Versatile Blogger Award. Thanks, John! His blog covers a variety of topics, including stories that have made a difference in people’s lives. He has completed two novels and is working on a third. 3. Post seven things about yourself. 4. Nominate fifteen bloggers for the award and link to them. I like reading books and blogs about writing. My novel, Freeblood, won Second Prize in the 2012 Amazon Breakthrough Novel Award (young adult category, although I consider it a crossover novel). I’m currently working on the sequel, Fastblood. I once trimmed my bangs too short before my husband’s holiday office party. Ridiculously short. Embarrassingly short. (Take note, people: naturally curly hair springs up when it dries.) Several attendees commented on my new hairstyle. I thanked them and pretended like it was intentional. Gah! I love flowers of all colors and sizes, and usually plant a big random variety in my summer beds. My husband receives a refreshing shower if he walks by while I’m watering my flowers. 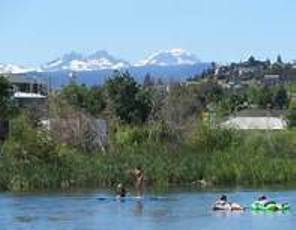 A favorite summer pastime is floating the Deschutes River in Bend, Oregon. Please accept the nomination in the spirit in which it was given. Some prefer not to post awards on their blog. No problem! I’m simply happy to share your website with others. Freeblood: The price will remain 99¢ until the end of the month, and then it goes back up to $2.99. 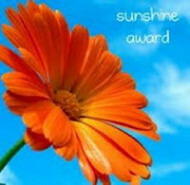 Coming up: More wordplay and the Sunshine Blogger Award, presented to me by Kimberly Bettes. Stay tuned! Writers are of two minds when it comes to character creation. Some believe that all character details should be worked out before any writing takes place. Others suggest that interesting background stories and characteristics emerge once writing is under way. Your preference may depend on whether you’re a plotter or a pantser. Plotters outline all story events ahead of time, while pantsers “fly by the seat of the pants,” a free-wheeling approach that emphasizes spontaneity. I consider myself to be somewhere in between—I work with a loose plot that allows for inspiration during the writing process. I also start with general ideas for characters, which are fleshed out by the time I arrive at the end of the first draft. I do find it useful somewhere along the way to go through a list like the one I’m presenting today. I’ve divided the list into six categories, but this is just a basic profile. If you’re working on a young adult novel set in a high school, for instance, you might delve more deeply into academic achievement, social skills, status, and school activities. I’ve also provided questions to help you look at your characters in different ways. Keep in mind that writers differ when it comes to physical descriptions. Some believe in supplying all the visual details, while others offer only the essentials and allow readers to imagine the rest. If you get stuck in a scene or with a plot point, it may be worthwhile to return to character creation. Further defining the family history or emotional makeup might just be the catalyst for getting things moving again. How do other characters view this character? Hard-working? Social climber? Spiritual? Eccentric? Consider relationships among family members as well as other forces that may affect the family. Any skeletons in the closet? Born with a silver spoon? Raised in the projects or the suburbs? Good times? Hard times? What main event from the past influences the character’s current life? Attitudes, self-image, general outlook, hopes, fears, motivations, traumas, ambitions, accomplishments, obsessions, regrets. Extrovert, introvert, or something in between? What does the character learn about him- or herself by the end of the story? How does the character change? Does the unique characteristic add balance and depth to the character or highlight an imbalance? The next step would be developing scenes or short vignettes to show the character traits. Strong characters are an essential element of a well-written story. Spending just a few minutes reading through a list of character traits helps develop fully rounded characters and may provide a jumping-off point for dynamic scenes and plot twists. Wordplay: What’s in a Name? Writing It Down: What’s Your Speed?